For zooarchaeologists, our main interest in the book comes from the excellent research into the amount of calories, protein, iron, fat, vitamins (and more!) attributed to various subsistence animals. Each page is devoted to one animal species, and features it’s Native names, a blurb on location and hunting strategy, preparation, and nutrition information. Towards the end of the book is a nice description of the specific parts of a moose/caribou, and how they are traditionally prepared and eaten by the Koyukon Athabascans. 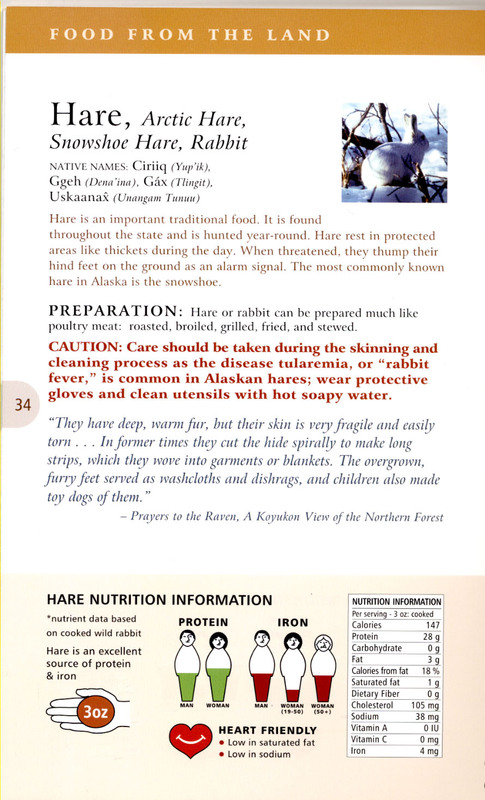 You can purchase this book directly from the Alaska Native Tribal Health Consortium’s website. If you’re local to Anchorage, you can also usually find a copy at Titlewave or the Museum bookstore. This entry was posted in Uncategorized and tagged Alaska, gathering, hunting, nutrition, subsistence, traditional, Zooarchaeology by Kelly E. Bookmark the permalink. Hi Kelly! Thanks for posting about the book. I’m going to order it right away! The nutrition information will be awesome for my dissertation on prehistoric seasonal resource stress in Kodiak. I’ve been trying to find nutrition info on shellfish in AK, but it’s been hard to come by. Hi Molly! I’m glad you can use the book! I’ll keep an eye out for more nutritional info : ) I can’t wait to read your thesis, it sounds fascinating! I really need this book! Where can I find it? Also what’s you thesis on? It’s a great book, hope you enjoy it!